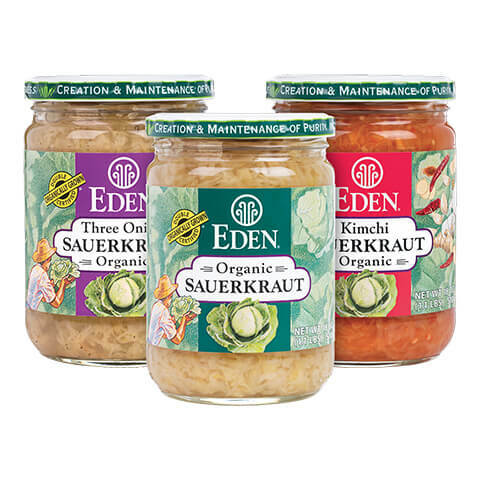 Three EDEN Sauerkrauts in New 18 oz. glass jars, all made of authentically organic ingredients. Two New Flavors. Kimchi Sauerkraut, spicy red with all organic kimchi herbs and spices. Three Onion Sauerkraut is mellow, sweet, and savory. 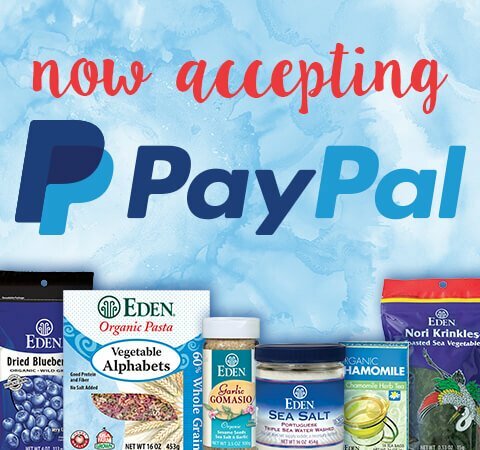 Original EDEN Sauerkraut homemade taste and lactic acid fermentation efficacy now comes in the new 18 oz. jar too, while continuing its availability in 32 oz. glass. 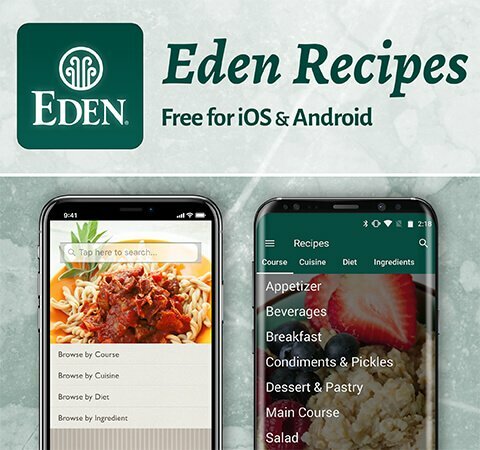 Over ninety years of experience, traditional methods, and one family’s care from field to jar give EDEN Sauerkraut exceptional character and spectacular flavor. No untoward additives, declared or undeclared, of any kind whatsoever. Kosher. 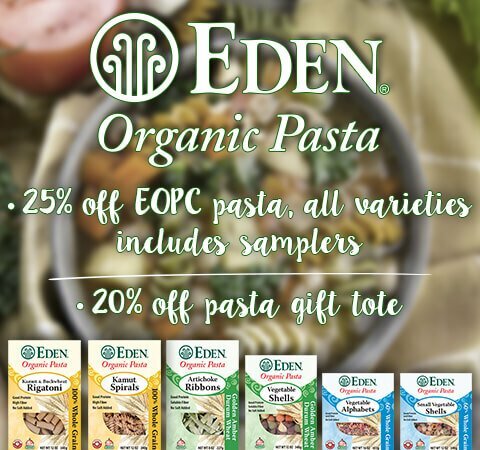 EDEN Spaghetti Sauce • Crushed Tomatoes • Crushed Tomatoes with Onion, Basil, & Garlic • Pizza Pasta Sauce • and No Salt Spaghetti Sauce are made of 5th generation, organic, hand cultivated and harvested, heirloom Italian Roma and Napoli tomatoes. These plum shaped tomatoes are Italian preferred. Sweeter, fewer seeds, deep color, and firmer flesh are better for sauces and canning. Where used, organic non-irradiated herbs and spices, organic extra virgin olive oil, and EDEN sea salt add flavor and value. 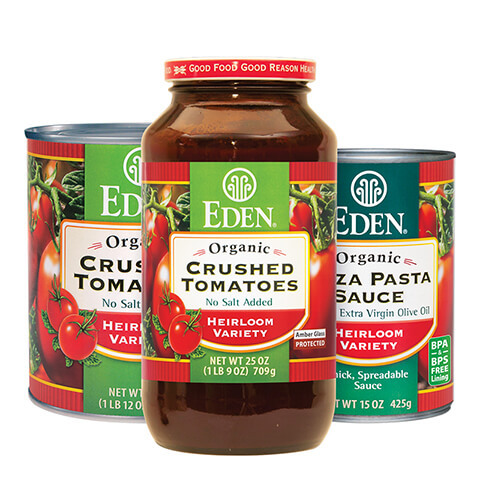 EDEN tomatoes are the only brand in the U.S.A. in protective amber glass to prevent light damage of flavor components and nutrients. The cans and glass are BPA & BPS free. Gluten Free. Kosher.